In the introductory part of the ceremony, the participants were welcomed by: Mr.Aleksandar Bogdanovic, president of the Union of Municipalities’ Executive Board and Mayor of Old Royal Capital Cetinje; Mr.Dan Redford, Deputy Head of the OSCE Mission in Montenegro and Ms.Dragana Ranitovic, Director General of the Directorate General of Public Administration and Local Government in Ministry of Interior. The speakers agreed that the best practices program gives an opportunity to all local governments to demonstrate their examples of good practice and to present innovative solutions in the delivery of services whose quality of life is largely determined by the quality level of services provided by local authorities. It was stressed that representatives of local governments, in occasional meetings and celebrations, emphasized that prestigious award serve to legitimize the quality of work and innovation in the provision of various services to the citizens. “Local governments in Montenegro properly identify the objectives of the program, which surely become an integral part of the development process at the local level, contributing to raise the standards of local governments to provide services, promote innovation and modernization of work, and the creation of a strong civil society through the promotion of capable and responsible local government, “said Mr.Aleksandar Bogdanovic, president of the Union of Municipalities’ Executive Board. The Decision on the selection of best practices in local government in Montenegro in 2016, on behalf of the Selection Panel, presented by Mr. Refik Bojadzic, Secretary General of the Union of Municipalities of Montenegro. The practice of Municipality of Mojkovac – “Improving environment and sustainable management of natural resources in the municipality of Mojkovac“, was presented by Ms. Jelena Vucetic. The practice of Municipality of Pljevlja– “Internet presentation – web portal services for protection and rescue of the municipality Pljevlja” was presented by Mr. Ratko Pejovic. The practice of Municipality of Tivat, – “Project RE assistant and mediator in the school “was presented by Mr. Petar Vujovic. The practice of Municipality of Bijelo Polje – “A small group community “, which received a special award , was presented by Ms. Saida Cikic. 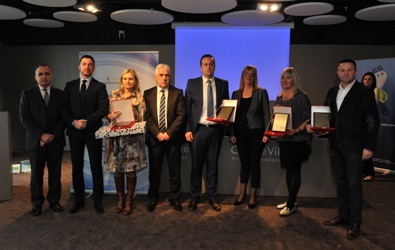 Prizes were received by Mr.Dejan Medojevic, Mayor of the Municipality of Mojkovac, Ms.Snezana Matijevic, Mayor of the Municipality of Tivat, Ms.Nemsa Omerhodzic, vice Mayor of the Municipality of Bijelo Polje, and Mr.Goran Cavic, commander of the Protection and Rescue of the Municipality of Pljevlja.